Wah, wah, wah. 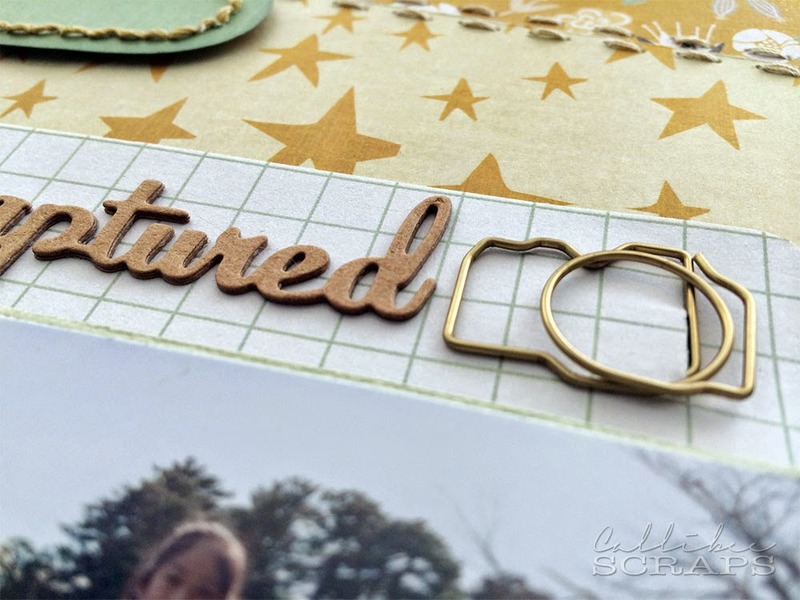 I have seriously been lacking on the scrapbook front. 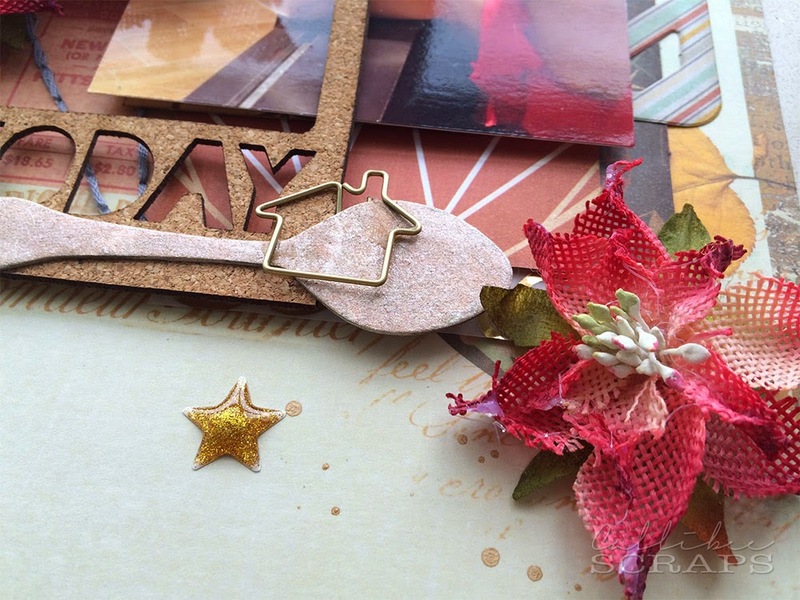 Apart from the layouts for January's kit, I've not done any scrapbooking in January. Partly because we were away from the 7th to the 20th; first in Singapore and then in Japan (I know, we travel a lot) and also to sheer laziness. Yup, I admit it - I've been having a great all time spending my free time watching You Tube card tutorials rather than creating. Funnily enough, I'm not a card maker, but I love to watch the process. These ladies are super talented and their video deliveries are concise and watchable. My favourites - Jennifer McGuire, Nichol Maqouirk, Kristina Werner, Vicky Papioannou and Shari Carroll. Do you have your favourites? Anyway, back to the creating that I did do - the February layouts. 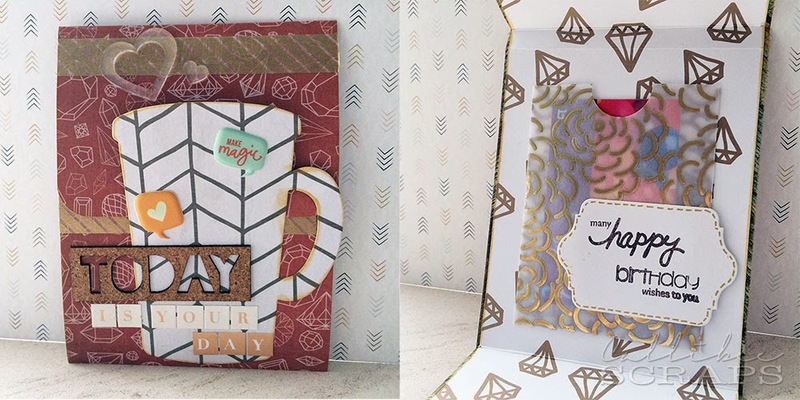 This month's jam packed kit brings in the diamond/gem trend which has been seen around CHA 2015 this year. 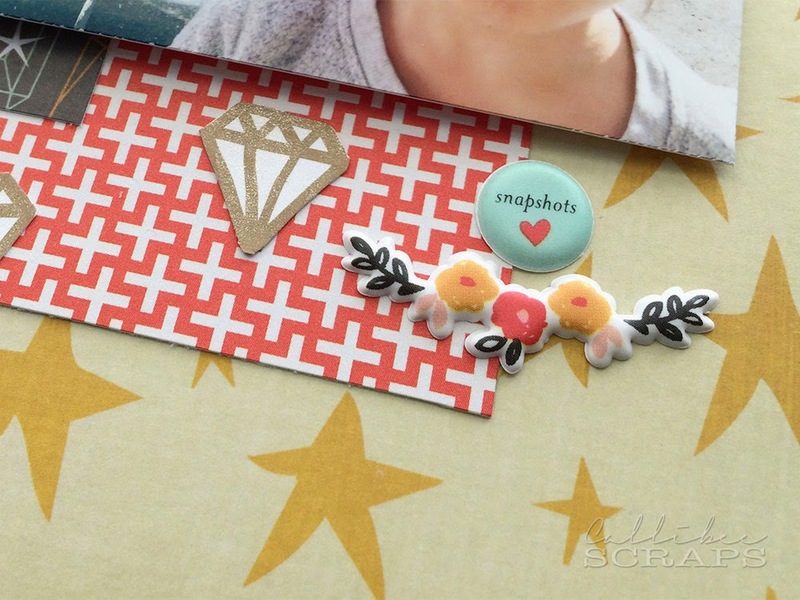 It's also perfect for Valentine's day cards or layouts - diamonds = engagements - that's what I think anyway. 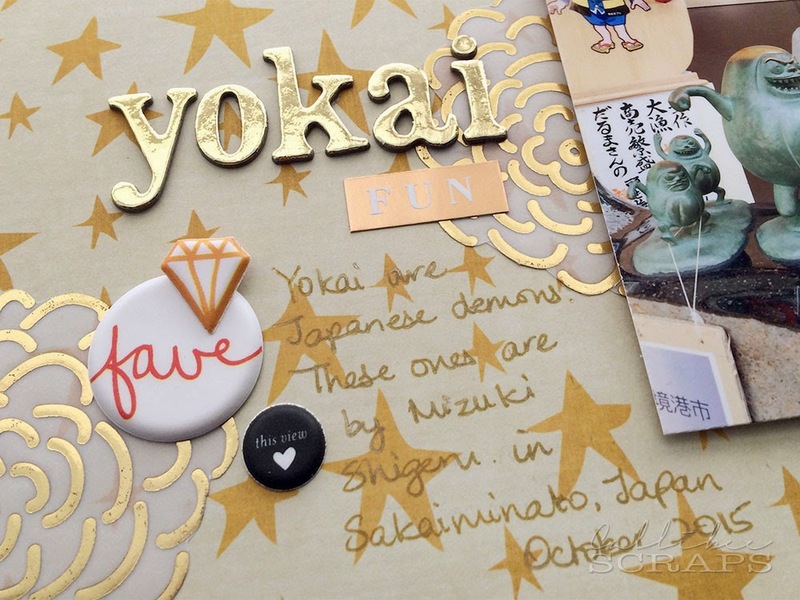 I love the starry paper; it's so fun and can be used in so many ways and not too overpowering. The photos were taken in Sakaiminato, Japan, the home town of famous Yokai cartoonist Mizuki Shigeru. Yokai are Japanese folklore monsters and ghouls. 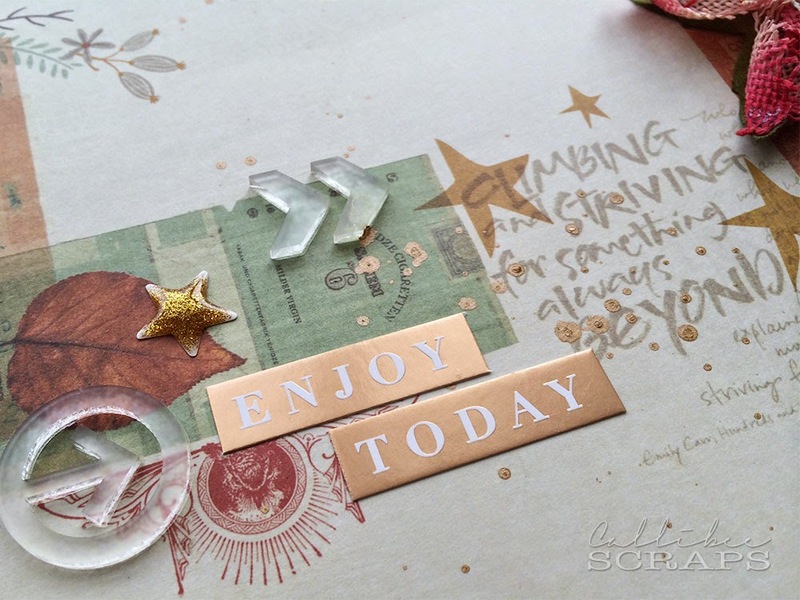 I cut out the gold blooms from the velum add on and they really pop around the page. I added gold alphas to tie the gold elements together. The puffy stickers are too adorable and they feel so soft, I couldn't stop touching them. The diamonds, I cut from one of the add on papers and gave them a brushing of clear Wink of Stella to make them shimmer. 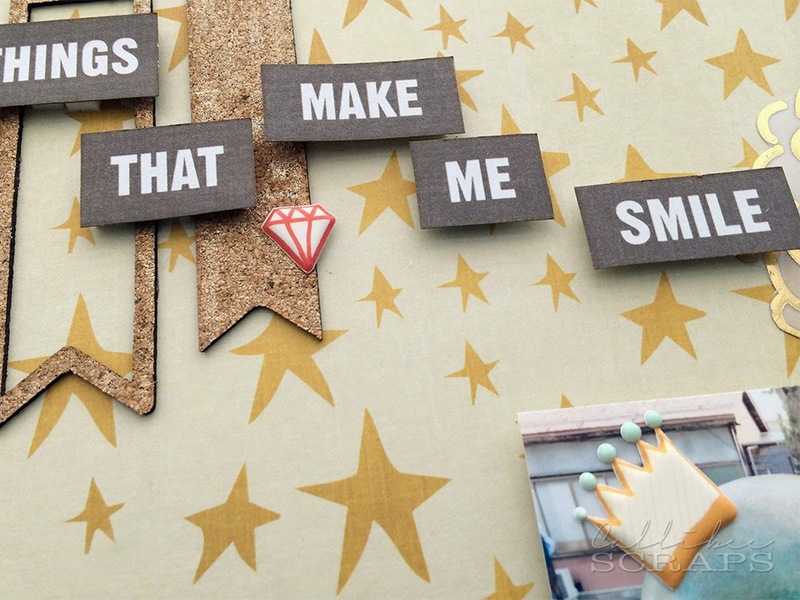 The cork board pieces add a natural texture to the page and I cut the staggered quote from one of the provided cards. More puffy stickers to round out the layout. 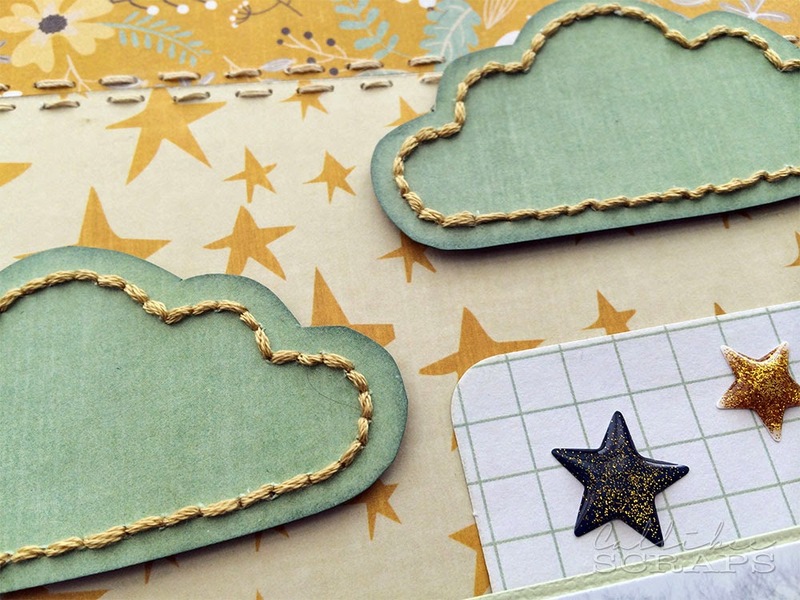 This month comes with a fun embroidery and template kit from Amy Tangerine. 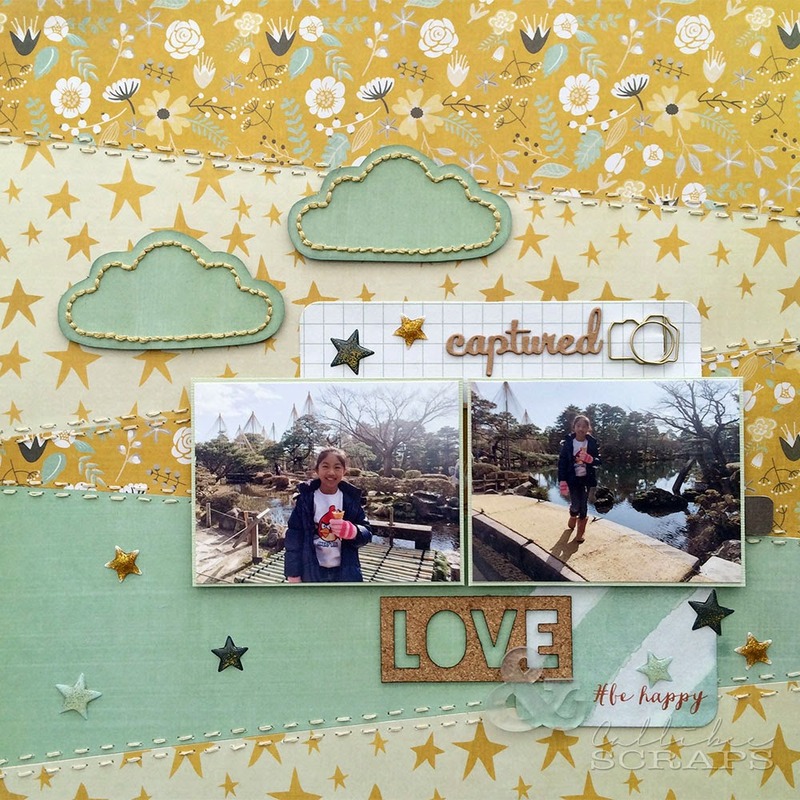 This inspired me to do a stitched patchwork layout, using complimentary colours. 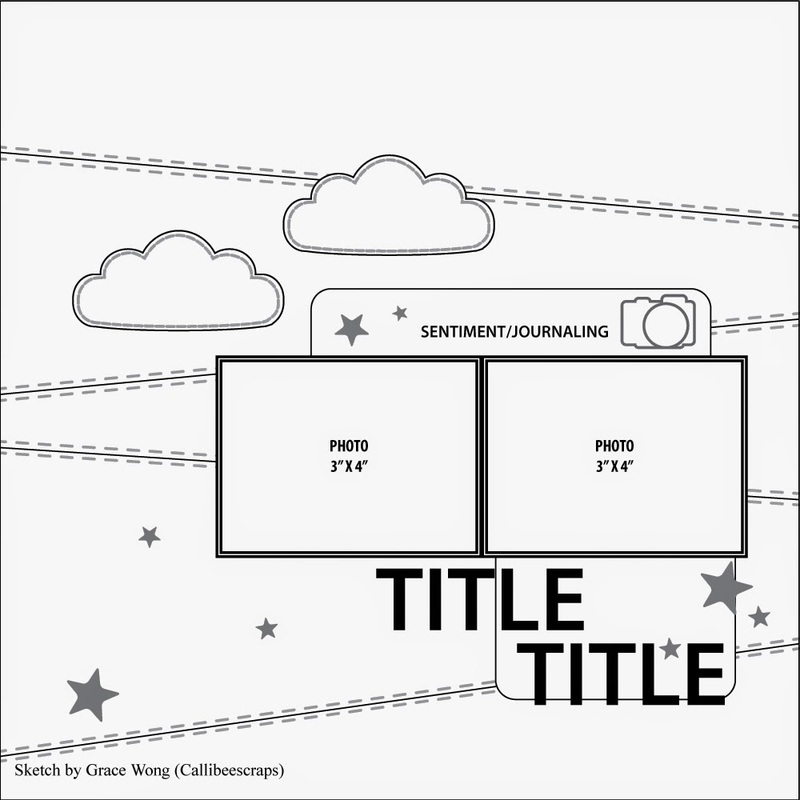 I kept the layout pretty simple otherwise, with few embellishments. I love the contrast of the cork board and acrylic. 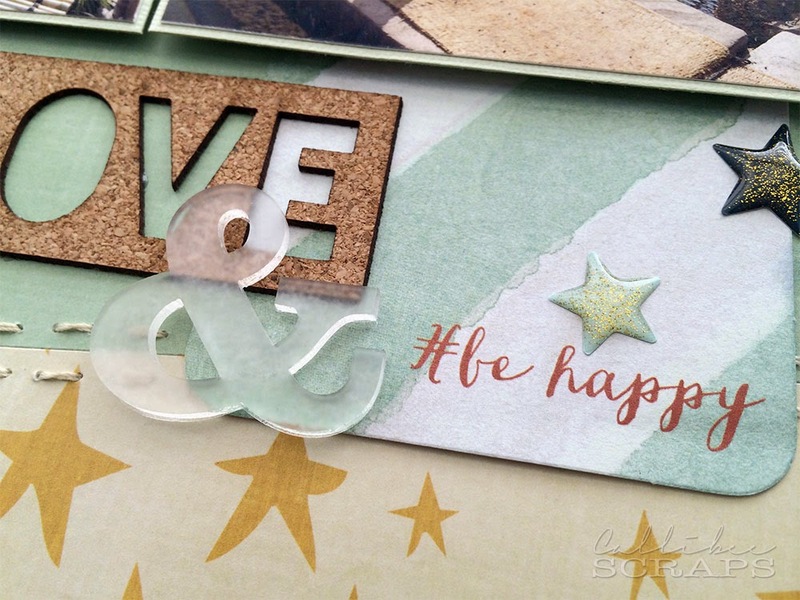 I used the #be happy card as part of the title. The little glitter stars are so cute and match the papers perfectly. The sweet clouds were part of the embroidery kit and even though I'm not much of a sewer, I thought these were well worth the effort. I then inked the edges with distress ink to give them more definition. 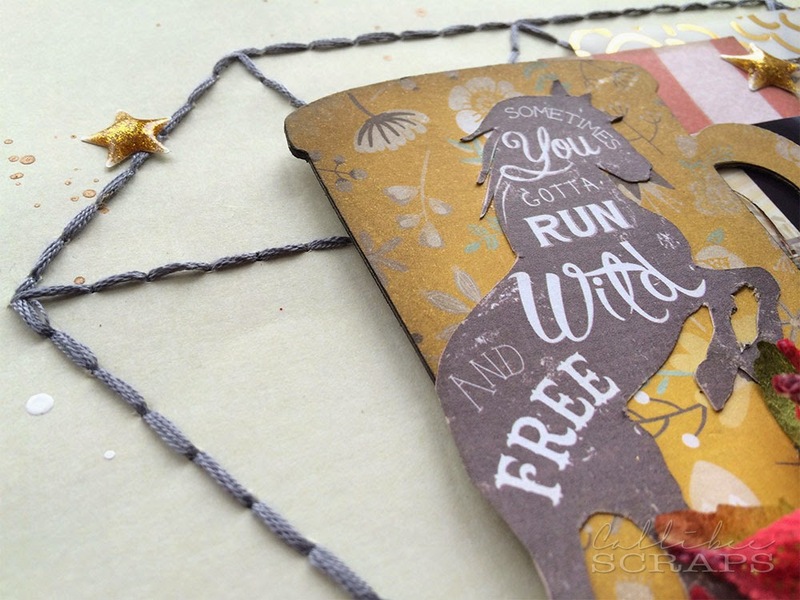 I die cut the "captured" on kraft paper and layered it three times to give it a chipboard feel. I cut a slit in the grid paper so I could slip the paper clip end of the camera in. I love the background paper for this layout. It already has a ready made layered look, so I wanted to keep more of that showing through on the left side, so I layered my photos and elements mainly on the right. I kept this side simple with see through acrylic elements and the title stickers. I did splatter gold and white paint over the page as I felt the open areas were a little stark. 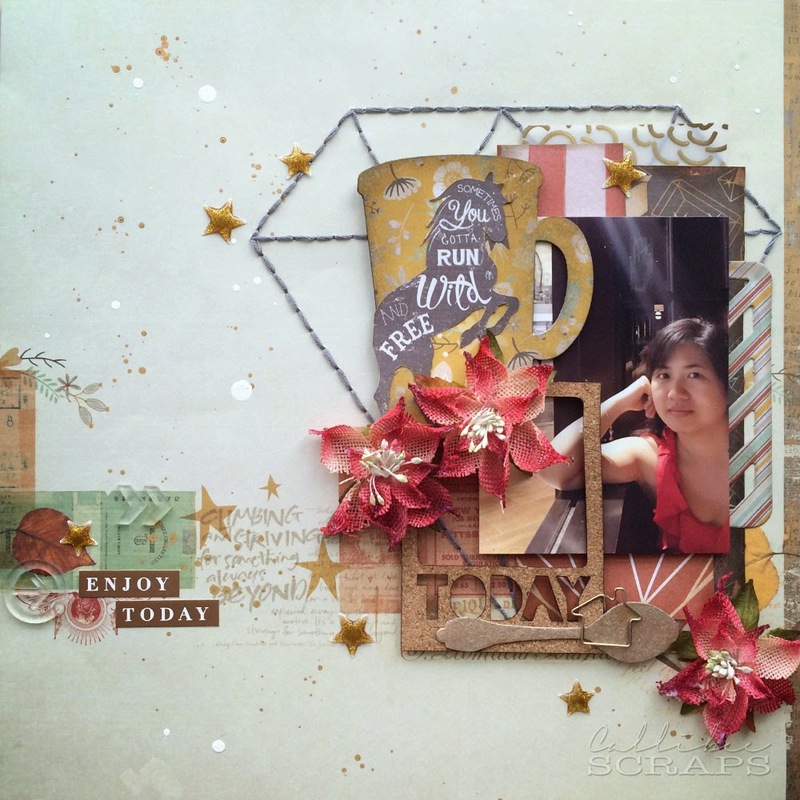 I love the red flowers and although they are poinsettias, I felt they could be other than for Christmas layouts. I just love the burlap look of them. I drew and stitched a giant diamond to go behind my main focus area and I think it turned out really well. I used this month's die set for the mug and spoon and cut the horse from one of the cards in the kit. I had lots of paper left, but didn't want to do another layout, so I decided to do a quick card. I used the coffee mug die again to make a tri-fold card. I stuck the bottom half of the mug on the lower flap and the top flap tucks in behind it. As the reverse side of the red gem paper was a dark green wood grain, I layered the diamond paper on the inside to brighten it up. I die cut a pocket from the gold blossom vellum and placed a gift card inside (it's just a dud; plan to change it out to a proper gift card when the time comes to give it away). I added a birthday banner on the pocket and drew a gold stitched border around it. Hope to see you at the crop and happy scrapping.